This week's question comes from Elizabeth, a reader whose daughter will be starting college in the fall. Q: We’re starting the financial aid application process, and I’m confused about what assets affect eligibility. What assets are included in the eligibility calculation? A: Congratulations, Elizabeth! After years of laughter, tears and arguments, the day your daughter heads off to college is just around the corner. With the amount of college students applying for financial aid, I have a feeling that many of our readers will find this topic interesting, so thank you for your question. Financial aid is structured to help make up the difference between what a family is able to pay and what a college charges. The basic idea is that everyone, regardless of means, should be given the opportunity to go to college. The majority of financial aid is provided at the federal and state levels, and includes interest-subsidized loans, work-study programs, and grants. Every year, the Federal Student Aid office of the U.S. Department of Education provides more than $150 billion in new aid to approximately 14 million college students. It’s important to note that not all schools participate in the Federal Student Aid programs, so it’s best to check with your school to find out what programs are available. The first thing to do to access financial aid is apply for it, usually by using the Free Application for Student Aid (FAFSA) form or by completing a specific college’s financial aid form. Both use similar formulas to determine how much need-based aid your child is eligible to receive. The three basic components of that formula are the cost of attendance (COA); the total resources provided to a child from outside sources (like a scholarship) which reduces the COA on a dollar-for-dollar basis, and; the amount your family is expected to contribute to your child’s college costs based on your particular financial situation, which is called the “Effective Family Contribution” (EFC). Subtract the Resources and EFC from the COA and you arrive at the Financial Need that the aid package will try to cover. Be sure to pay attention to the deadlines for submitting your student aid application! There are federal and state deadlines, and your college may also have a deadline. The federal deadline for online applications for the 2010-2011 school year is midnight Central Daylight Time, June 30, 2011. If you’re not sure you’ll qualify, I suggest you apply anyway. The application is necessary for obtaining government-sponsored loans and you may be surprised with how much aid is extended to you. For divorced parents, the custodial parent is responsible for completing the FAFSA. It should be noted that any child support and/or alimony received from the non-custodial parent must be included on the FAFSA. The Federal government does not consider the income and assets of the non-custodial parent in determining a student’s financial need. 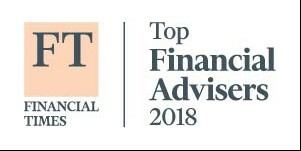 Fortunately, neither a parent’s nor a child’s qualified retirement assets (investments in 401(k) plans, regular or Roth IRAs) are considered a resource. This makes sense, since those assets are vital to your own and your child’s long-term future. The basic components to determining your EFC are your current income and non-retirement assets. The equity in your primary residence, a family-owned business, insurance policies, and annuities are also excluded from your assets when determining EFC. Since a child’s own assets and income are reported on financial aid applications at a much higher rate than those of their parents, it’s advantageous to have fewer assets in the child’s name and more in the parents’ names. For that reason, 529 plans tend to be a better choice than custodial accounts. Assets in 529 plans are considered to be the parents’ if the child is a dependent on your tax return. They generally have a fairly low impact on a student’s financial aid eligibility, usually a maximum of 5.6% of the value. On the other hand, custodial accounts are the student’s assets and are assessed at 20% in most cases. Also worth looking into are 529 plans established in a relative’s name for a child. If a 529 plan is set up this way, it won’t factor into the financial aid application at all. This is because the relative who is contributing – not the parents or the child – owns the account. Withdrawals from 529 plans expressly used for college expenses are also favorably treated. Because withdrawals of that nature are excluded from your federal income tax return, they are not required to be included as income on the FAFSA. On the other hand, withdrawals from retirement accounts for college expenses aren’t treated as advantageously. While you can take money out of your Roth or traditional IRA for qualified college expenses penalty-free, it may put your financial aid eligibility at risk the following year. The entire withdrawal plus principal and earnings count as income on the following year’s application. As briefly touched on above, it’s also unwise to withdraw IRA assets to pay for your child’s college expenses because it infringes upon your own retirement preparation. I cannot stress enough that you should never pay for your child’s postsecondary education instead of saving for your own retirement during your working years. Elizabeth, thanks again for your question. I hope my explanation has given you some understanding of the financial aid process and the components that might affect your daughter’s eligibility. Good luck to both of you in this exciting new chapter of your lives! A few years ago, I assisted a client who had been denied by the U.S. Department of Housing and Urban Development (HUD) in his application for an FHA (Federal Housing Administration) loan. My client and I traveled to Washington, D.C. to visit with HUD officials and politicians from my client’s voting district. It wound up being quite an eye-opening day trip. After landing at Washington Dulles International Airport, we took a cab to the HUD office, which took a while due to D.C.’s gridlocked traffic (if you think Atlanta’s traffic is bad, I suggest trying to drive through D.C.) The HUD building in Washington, D.C. is quite impressive; it’s a typical stately building that takes up an entire city block and that is approximately 10 floors. After going through security at the HUD office, we were escorted to the 5th floor. As we walked down the corridor to meet with the HUD representative, I couldn’t help but be completely amazed by the number of employees on that floor alone. Peeking into the relatively standard sized offices, I noticed that each was jam-packed with five or six desks. It made me wonder what sort of projects required this many employees. During a meeting break, my client and I grabbed lunch in the cafeteria along with about 1,000 HUD employees who were hurriedly eating their meals to get back to their HUD tasks. As the meeting continued, I became even more amazed with the endless bureaucracy of scheduled appointments and other activities carried on by the HUD officials. Eventually, my client received the FHA loan, but it was not without continuous meetings, correspondence and political influence that lasted well over a year. The subject of this post made me reminisce about my HUD experience and wonder why all of those employees are necessary. 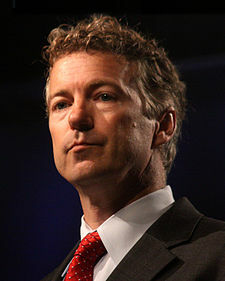 Last week, Rand Paul wrote an opinion piece for the Wall Street Journal, “A Modest $500 Billion Proposal.” As you likely know, Rand Paul is the junior Republican senator from Kentucky and is also a member of the Tea Party movement. I honestly hadn’t paid much attention to Rand Paul before the WSJ article, but I was intrigued by Paul’s proposal to immediately cut $500 billion in spending. Initially, I dismissed his proposal as totally unfeasible. However, after doing some research, I’m not so sure his plan isn’t doable. As a libertarian, Ron Paul advocates a much smaller government. That’s something I believe in, too, but not in such an extreme fashion. He does not believe in military operations outside the U.S. borders and would like to immediately withdraw all troops from all foreign countries. 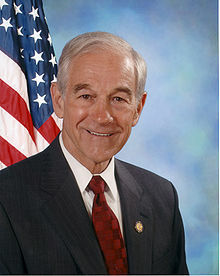 Ron Paul opposes the collection of individual income taxes, and believes that things like excise taxes should be implemented instead. He also supports the gradual elimination of the Federal Reserve System in an effort to let market forces control interest rates. This, in particular, gives him a lack of credibility in almost every respect. Basically, Ron Paul believes that almost everything should be decided at the state level, and that the states should regulate all social matters not directly specified in the Constitution. While some of his causes may be admirable, many of his positions are extreme and polarizing. Rand Paul’s educational background is similar to his father’s. He is a practicing ophthalmologist with his own clinic in Bowling Green, Kentucky, having received his medical degree from Duke University. While he shares many of Dr. No’s political positions, he doesn’t seem quite as radical. With Rand Paul’s affiliation with the Tea Party movement and his political activism, the current administration would be ill-advised to disregard him. 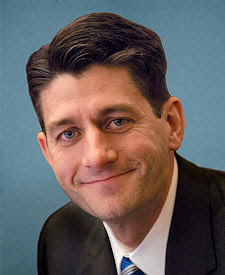 I am impressed by Paul Ryan, the U.S. Representative from Wisconsin who is the chairman of the House Budget Committee. Ryan has appeared on CNBC and other news networks discussing economic issues. I find him to be one of the few members of Congress with an intellectual understanding of the Federal budget and how it works. Recently, Paul Ryan issued the House GOP budget proposal for the rest of the 2011 fiscal year. In it, a Federal spending reduction of a prorated $38 billion was proposed of the $100 billion decrease the Republicans promised during the campaigns. The theory is that with only seven months left in the fiscal year once the budget is approved on March 4, 2011, $38 billion would be the prorated savings of the $100 billion commitment. As you are probably aware, there is currently no Federal budget. The Obama Administration has not passed a revised budget for fiscal 2011 even though the Democrats had control over the House, the Senate and the Executive Branch. Even they cannot agree to any type of spending levels. 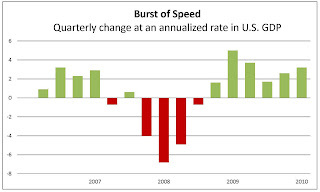 It is estimated that the Federal deficit for fiscal 2011 will be close to $1.65 trillion, which is somewhat larger than last year’s deficit and will be the largest ever in the U.S. As anyone with a household budget knows, deficits can’t go on continuously, and $38 billion towards this level of deficit is only a drop in that proverbial bucket. Let’s put this in perspective – a $38 billion reduction in the deficit would bring it to $1.6462 trillion. The GOP has amended their spending cuts to be a true $100 billion in savings. Big whoop! 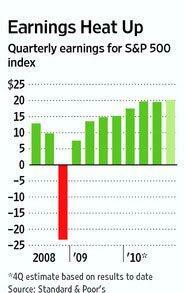 Again, this is a very small reduction in Federal spending for an absolutely ridiculous deficit. Even though the entire country is now focused on deficit reduction, the Obama Administration does not appear to have gotten the drift. It’s reported that this week, the Executive Branch will propose a new high-speed rail program being spurred by $8 billion in Recovery Act grants plus additional deficits totaling approximately $50 billion. While this program may be needed, it should not be financed by the Federal government without extraordinary deficit cuts elsewhere in the budget. The White House announced the President’s budget for fiscal year 2012 on Monday morning. It is projected that over the next 10 years, the Federal deficit will be cut by $1 trillion. Notwithstanding the fact that the President’s appointed Deficit Compromise Committee had recommended a reduction of deficits of $4 trillion, the President only recommended a deficit reduction of $1 trillion. It was not pointed out that over the next 10 year period, over $10 trillion in new debt will be added to the U.S. economy. Remember -- $10 trillion is greater than all the debts ever created in the United States before 2008. Quite frankly, if we wait 10 years to get the Federal deficit anywhere close to being balanced, we will be giving away the U.S.’s credibility and financial stability. All of these things get me back to Rand Paul’s proposal in the WSJ, which I actually think has some merit. He is proposing major cuts to the Departments of Agriculture and Transportation, which he says would save about $84 billion. He is also proposing cuts to the Departments of Energy and Housing and Urban Development to the tune of $50 billion each, and would also like to cut $80 billion by “removing education from the federal government’s jurisdiction,” meaning that the states would operate their own education departments. I have always believed that education is a state priority that should be handled at the local level. In all honesty, I do not understand how the U.S. Department of Education can spend $100 billion with what they do, and it’s absurd to me that college loan programs are run out of Washington when it should be a local bank function. In addition, Rand Paul proposed reductions in international aid and other agencies, for a grand total of over $500 billion in spending cuts. Nothing in his proposal would affect Social Security or Medicare. President Obama has already proposed major cuts to the Department of Defense, a move that everyone should agree with since this department has grown 120% in costs in the last decade. These costs are in addition to those from the Iraq and Afghanistan wars. Almost everyone realizes that this department has grown too big, become too bureaucratic and become too inefficient. Rand Paul’s spending cut proposal along with some reasonable changes to Social Security and Medicare could reduce the Federal deficit by almost 50% in one year. There will almost assuredly need to be an increase the Social Security retirement age, an increase in taxes and some form of a user fee for Medicare recipients. A big dent could be put in the Federal deficit over a short period of time if the politicians in Washington had the political willpower to implement these spending cuts. Many will undoubtedly question how these cutbacks will displace perhaps a million or so Federal workers. I reiterate that I don’t think it’s fair for U.S. taxpayers to continue to subsidize Federal employees that may not be providing valuable services. If these employees are so talented and necessary, then the private sector will assuredly rush to hire them. It’s inconceivable that these employees would not find gainful employment outside of the public sector. The Obama Administration argues that such large cuts in Federal funding would be detrimental to our current economy and to employment. However, it’s easily argued that after trillions of dollars in Federal stimulus and low interest rates, employment levels have barely budged. It would seem logical to assert that if that plan has not worked and the long-term stability of the financial systems in the U.S. has been compromised, then perhaps another tactic is worthy of a try. Frankly, I would rather have a bad economy and no deficits than a bad economy and gigantic deficits.